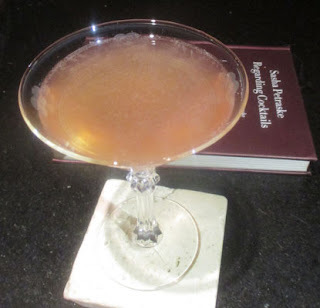 Two Sundays ago, I reach for Sasha Petraske's Regarding Cocktails book and spotted Joseph Schwartz's variation on the Blinker that he crafted at Milk & Honey. He dubbed this one the Sugarplum after the pet name of Joseph's wife given to her by her grandmother, and the text mentions that this recipe makes a great tequila variation. If it included the Blinker's classic raspberry syrup (instead of the general but flabby substitute of grenadine), it would be rather similar to the Orlando in Pioneers of Mixing at Elite Bars. In the glass, the Sugarplum's bouquet showcased the grapefruit melding with the gin's juniper-pine aroma. Next, grapefruit and a dry berry note on the sip gave way to juniper, pomegranate, and grapefruit peel flavors on the swallow.